The Verde Valley was recently named a top 10 travel destination by Lonely Planet, so come enjoy a wonderful day of touring with DETOURS. Take a tour of the historic ghost town of Jerome, a tour of the Copper Art Museum in Clarkdale, as well as stunning views from your first class seat on the Verde Canyon Railroad (lunch is included). This guided tour of the Verde Canyon Railroad and Jerome departs from the Phoenix/Scottsdale area on Wednesday and Saturday between 6:30am and 7:30am, and returns between 6:30pm and 7:30pm. The day will begin with a pick up from most hotels in the Phoenix/Scottsdale area. After hotel pick up, we will tour to the heart of the Verde Valley which was recently named a Top 10 travel destination by Lonely Planet. 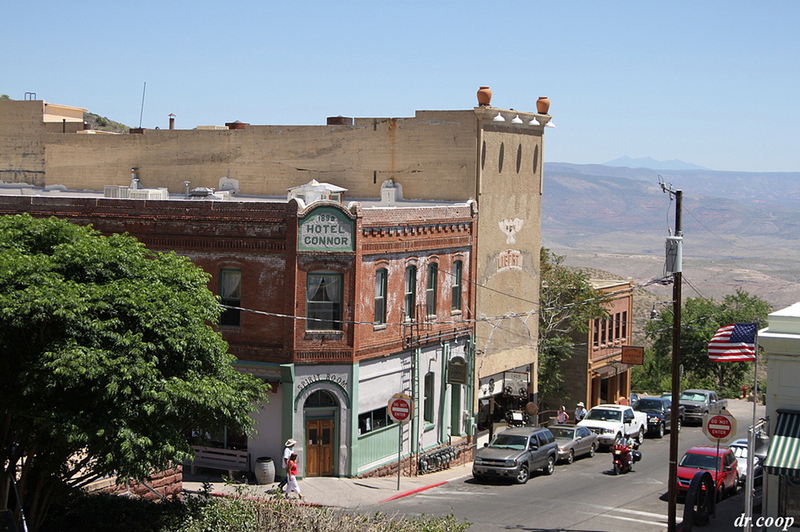 After our Jerome tour, we’ll visit the copper mining mecca of Clarkdale and the Arizona Copper Art Museum. Using the original school house, the Arizona Copper Art Museum tour showcases more than 5,000 unique pieces dating back to 3500 BCE. During our time at this world class art museum, guests will explore both functional and artistic uses of this second oldest known metal on the planet. From the practical uses in home kitchen supplies and tools to the ornate works of art used to adorn palaces and castles, the wide uses of copper are nothing short of amazing! Temperatures at the Verde Canyon vary by season. We recommend our guests bring jackets in the event of changing weather patterns. Memorable experience and unique way to experience a portion of AZ! I was looking for a day trip that freed me up from driving all day to sightsee with my husband and 84 year old mother. The tour bus seated less than 20 and proved a comfortable, easy to access ride. We visited a unique copper museum with a tour just over an hour that will remain a surprising highlight of our trip. The train ride through the Verde Canyon was leisurely paced, provided a variety of fresh fruit and snacks and spectacular scenery. The guides on this trip were well informed, personable and of good humor. We would definitely book another tour with DETOURS of Arizona. The round trip train ride is approximately 4 hours long. These are all approximations, please check the weather prior to your tour. Winter temperatures range from 20-50 degrees fahrenheit. Spring and fall temperatures range from 50-80 degrees fahrenheit. Summer temperatures range from 80-100 degrees fahrenheit. Soak up the beauty of Sedona, the unique history of Route 66 and the Grand Canyon on your two-day tour including a ride aboard the famous Grand Canyon Railway.